It was a welcome surprise to see in the prime minister's mandate letter to Jean-Yves Duclos, the new minister of families, children and social development, a commitment to develop a Canadian Poverty Reduction Strategy. What must be included to make sure it is done right? 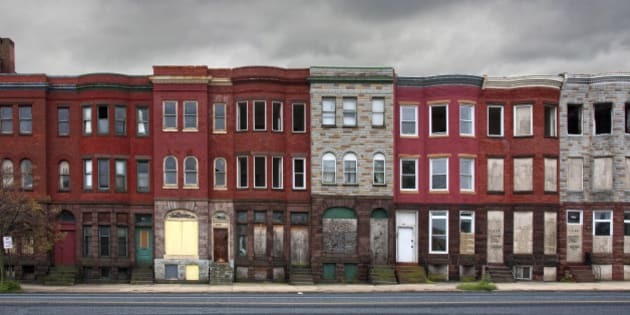 Group of vacant houses in Baltimore, Maryland. Poverty, urban decay, blight, crime, renewal. As we enter 2016, Canadians are speculating about what the new federal government might do in its first full year of governing. There are a few things that we know already: they will present their first budget, continue to resettle Syrian refugees and begin the first steps to set emissions reduction goals and implement the Paris climate agreement. But anti-poverty advocates are eyeing a promise that has received much less media coverage. It was a welcome surprise to see in the prime minister's mandate letter to Jean-Yves Duclos, the new minister of families, children and social development, a commitment to develop a Canadian Poverty Reduction Strategy. A similar commitment was made in the 2011 Liberal platform, but there was no mention in the Liberals' 2015 federal election campaign platform. This leaves anti-poverty advocates with several questions. How high on the government's priority list is this? How soon will a plan be implemented? What must be included to make sure it is done right? The mandate letter outlined that the Canadian Poverty Reduction Strategy would "set targets to reduce poverty and measure and publicly report on our progress" and "align with and support existing provincial and municipal poverty reduction strategies." This could have been framed in a more ambitious manner as a Canadian Poverty Eradication Strategy. Though it still depends on how it is rolled out, this announcement is real progress. For several years, the UN and anti-poverty groups have been pushing for a national anti-poverty plan. Dignity for All: The campaign to end poverty in Canada has worked toward this goal, through broad consultation, since 2009. In February 2015 on Parliament Hill, the campaign launched a model National Anti-Poverty Plan. Based on our experience, here are five key characteristics any solid national strategy should include. Poverty has multiple dimensions. Key areas of focus where federal policy can address poverty include income security, housing, food security, health, early childhood education and care, and employment. Some of these areas are included as commitments in the mandate letter to the minister, but referred to separately from the new strategy. It is clear that firm targets and timelines, legislated by Parliament, are essential to an effective poverty reduction strategy -- as we've learned from provincial strategies. The mandate letter calls for targets with measures and public reporting. It will be important for the minister to outline this more clearly. An effective, responsive poverty reduction strategy must be shaped by broad consultation. This must involve people with lived experience of poverty, first of all. It also requires close collaboration across levels of government and across ministries. Much of the groundwork has been done so it would also involve anti-poverty organizations and social policy organizations that have spent decades on policy analysis and advocacy. These organizations are ready to support the development of a good strategy. A process of consultation should not delay forward movement, however. A national poverty reduction strategy should be developed as part of a larger human rights framework. This includes recognizing that Canada has ratified international human rights conventions that obligate us to address poverty as a human rights violation. This further compels us to involve those most marginalized and to recognize that in Canada poverty affects some communities in disproportionately high numbers. Indigenous peoples in Canada have poverty rates that are shocking, with one quarter of Indigenous people living in poverty. Newcomers to Canada and racialized Canadians face similar challenges. It is far past the time for Canada to address these realities. Of course, a national poverty reduction strategy can only work if there is dedicated funding attached. Costing for the development and implementation of a strategy should not be a barrier. It already costs more to Canadians to deal with the impacts of poverty, such as health costs, than it would to implement a strategy to end poverty. According to some estimates, poverty in Canada costs us between $72 and $84 billion each year. The real loss, however, is the cost to our communities and Canada's future. When people are left on the margins we lose the creativity, skills and diversity that enriches us all. An effective national poverty reduction strategy is possible. It's past time for the federal government to take leadership and to take action to build a Canada free of poverty.